Not only have I been blogging for 8 years today. I reached another milestone just now. Since November 2007 I have tweeted 10,000 times and to celebrate this occasion I have produced this little infographic of my Twitter history. It was partially created with the service visual.ly, but about half of the content has been included manually by me. Happy 10,000 tweets to me! You can find me on Twitter as @kullin. The interest in the online sharing platform FriendFeed decreased considerably after Facebook acquired the company, but the service is by no means dead. Here is an interesting infographic with statistics about FriendFeed. It shows for example that Swedish is one of the top ten languages on the service. I have just compiled the statistics from my latest survey BlogSweden 5 (in Swedish: Bloggsverige 5) and a report was published in Swedish in the previous post. A total of 2,251 bloggers and blog readers answered the survey. A translation will be posted later. 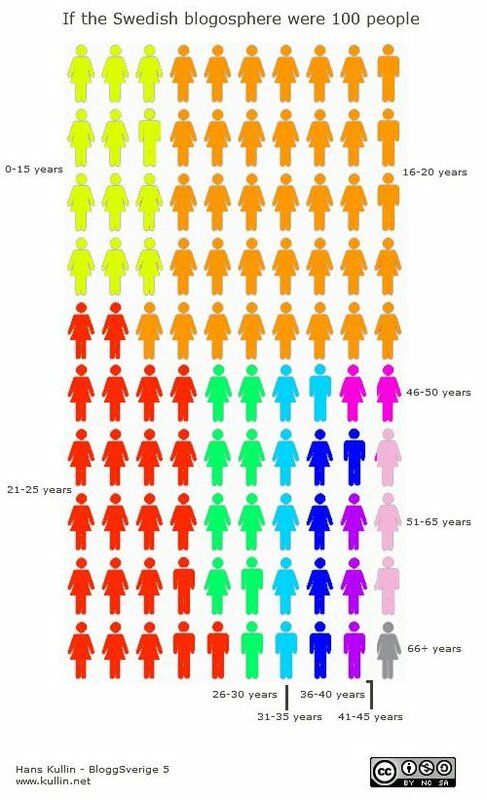 In the meantime, below is an infographic that could represent the Swedish blogosphere in 2010, if it were 100 people. A presentation of BlogSweden 4, conducted in 2009 can be found on Slideshare. Note: Respondents were chosen by convenience sampling which means that the results of the survey is not statistically valid for all Swedish bloggers, but only for the respondents of the survey.